They say that when your second baby comes around you are not as picky or concerned as you were with the first. Wrong! I want the best for my new baby just as much as I did with my first. I want them both to have the healthiest food, environment, clothes and even toys! I’m convinced that everything that they come in contact with has effects on their well-being. So, when I was given the opportunity to review organic and eco safe baby swag from Finn + Emma, I was very excited to do so! I chose a long sleeve body suit, footed pants, a wood teething rattle, and headband to review. Everything totaled $76 and it included shipping! The body suit and footed pants are size 0-3 months so they don’t fit my 5-week old yet. Actually, the footed pants are really long and probably won’t fit her until she’s 6-9 months but I don’t mind. The clothes are super soft and will be perfect for her to wear in whatever season we are in once she fits into them. And, how fitting is the teething rattle! Perfect for a baby that will be taking a lot of photos for the gram! All of their wood toys are made from untreated Indian hardwood, finished with vegetable seed wax, and filled with little beans. They also have a line of muslin blankets in bright beautiful colors, wooden play gyms and corresponding play mats. 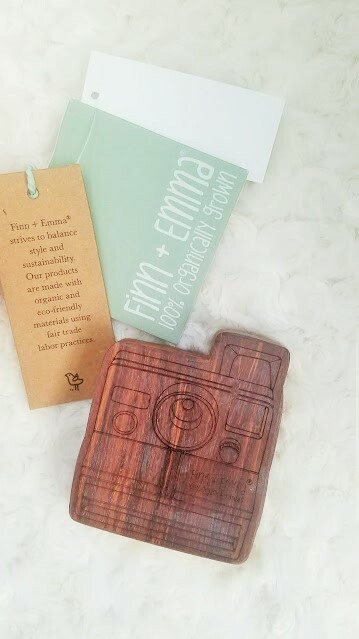 If you want the best for your baby and are health and eco conscious check out Finn+ Emma!